Almost all kids seem to love Santa in theory. Most kids seem to like Santa in person. Some kids do not want to have anything to do with the fat, scary guy’s lap. This beautiful little girl screaming at the top of her lungs is none other than my wonderful Thing 1, who at the time was not keen on seeing the good St. Nick facsimile. When Thing 1 was born, there was a particular judge who always asked how she was doing. I was always sure to show off any new pictures of my little girl and I emailed this picture to the judge. The next week I had a court appearance in front of this judge in a criminal case. As I approached the bench with my client, she told me she got the wonderful picture as she raised up a letter-sized sheet of paper with the color picture she had printed out. It was a bit embarrassing to have her showing off the picture in court in front of my client, but I was glad she enjoyed it nonetheless. Sometimes my job is like Mr. Mall Santa’s. Most of the people I interact with are comfortable with and appreciate my presence. Some of the people I deal with act like screaming children. I am always struck by the look on Mr. 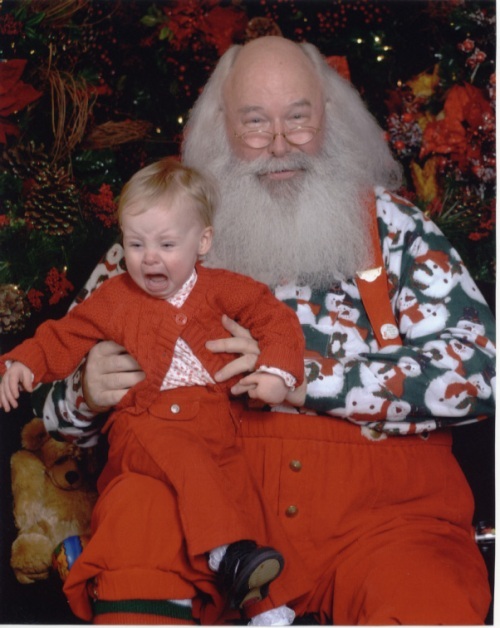 Mall Santa’s face in this picture. He has a positive, amused look about him. No doubt she was not the first screaming child of his day nor was she likely to be his last, but he was able to keep from letting it bring him down. I am going to try to keep this in mind next time I have a “screaming child” in my office.